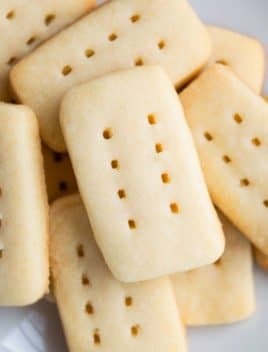 The best, old fashioned, classic, homemade, quick, easy shortbread cookies recipe, made with 3 simple ingredients: Butter, Sugar, Flour. Soft and crumbly! My family and friends love this classic holiday cookie. It’s soft and buttery and just melts in your mouth. You can take it over the top by dipping in chocolate, drizzling glaze. They are also great as a homemade gift and perfect for dunking in coffee. These are just as popular as my Classic No Bake Cookies and my Best Sugar Cookies (Small Batch). 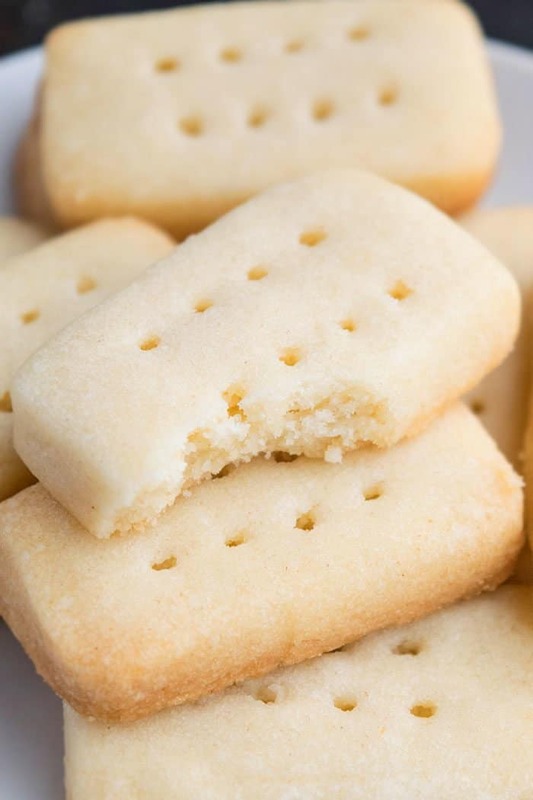 What is the difference between a sugar cookie and a shortbread cookie recipe? 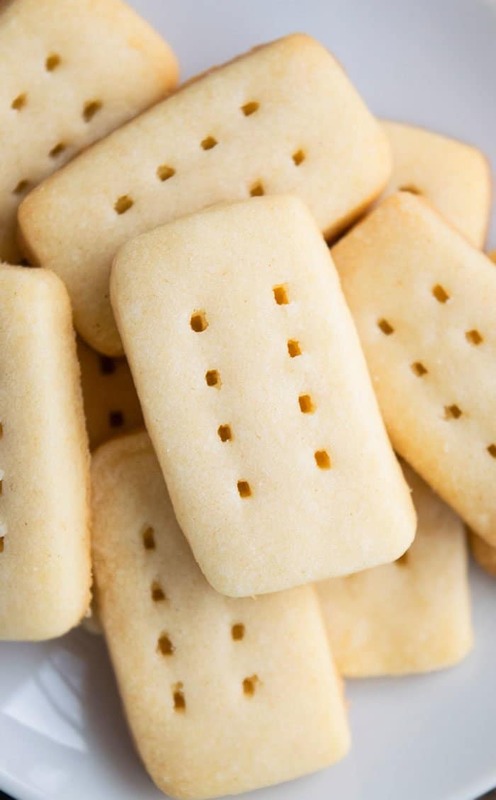 Shortbreads have a soft and crumbly texture because of the large quantity of butter whereas sugar cookie are firm, soft and sometimes chewy. The latter also has baking powder or baking soda to help it rise. 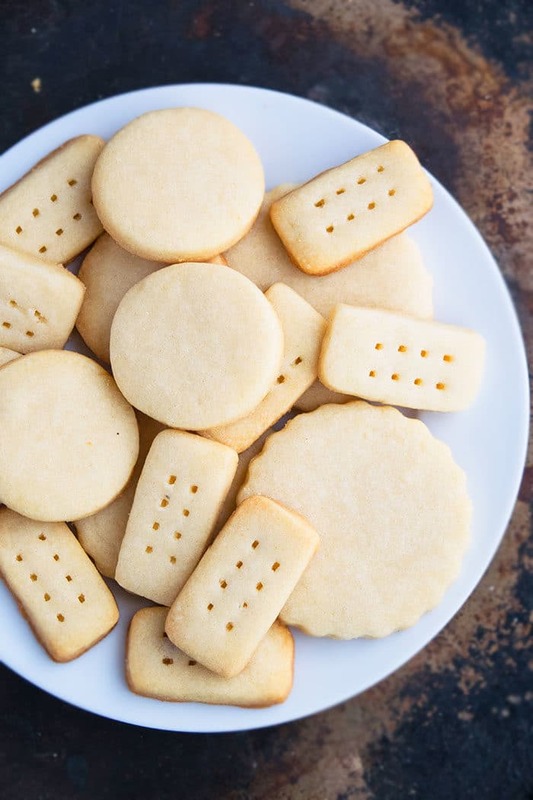 How do you make homemade shortbread cookies? Do shortbread cookies have eggs? No, they do not have eggs. They are only made with butter, sugar and flour. When lining the cookie tray with parchment paper, it’s wise to leave a little hanging off the sides to make it easy to lift out the cookies, once they are fully baked. This is probably the only time I would ever ask you to use salted butter. It creates that authentic sweet and salty flavor. Of course, you can replace salted butter with unsalted butter, if you like. IMPORTANT: THIS COOKIE DOUGH IS SUPPOSED TO BE CRUMBLY. DO NOT ADD WATER OR MILK TO THIN IT OUT BECAUSE IT WILL CHANGE THE TEXTURE. Do not over-mix the dough because that will yield tough cookies. There is NO baking powder or baking soda either. Only all-purpose flour works well in this recipe. Do not replace it with any other flour. You must use powdered sugar rather than granulated sugar because it blends together better and more smoothly with the butter. The butter must be at room temperature so that it blends together smoothly and evenly with the other ingredients. Lemon– Mix in 1 tsp lemon zest and drizzle lemon icing/ glaze, when cookies are fully baked and have cooled down. You can also use lime zest. Chocolate– Mix in 1/2 cup mini chocolate chips. You can also make simple chocolate dipped cookies or drizzle melted chocolate on top of baked cookies. Make cookie sandwiches or thumbprints with cherry or raspberry jam filling. Icing and glaze– Once the cookies cool down, spread vanilla frosting on top or drizzle a sugar glaze. Nuts– Mix in 1/4 cup finely chopped nuts such as almonds, pecans, walnuts. Herbs– Mix in crushed dried herbs such as rosemary, lavender, roses. Cranberry orange– Mix in 1/4 cup chopped dried cranberries and 1 tsp orange zest. Sprinkles– Mix in 1/4 cup small colorful sprinkles. You also use seasonal or holiday themed sprinkles to fit the theme. Color– Use gel coloring to tint the dough and make it fun for kids birthday parties. Add flour and mix until just combined. The cookie dough will be very soft and crumbly. That’s the way it’s supposed to be! Now, you have 2 options: 1) Spread mixture on a cookie tray, lined with parchment paper. Poke decorative holes with a fork and bake OR 2) Make cut out shapes like I did by kneading the dough a little and then rolling it between 2 sheets of wax paper. Then, use cookie cutters (like a small rectangle cutter) to cut out shapes. Use a spatula to gently pick them up and place them on a cookie tray, lined with parchment paper and bake. Bake for 12 to 15 minutes or until edges are firm and slightly golden brown. If you went through option 1, remove tray from oven and quickly use a sharp knife to cut rectangle slices. Let the cookies cool down completely then remove from tray and enjoy. If you went through option 2, remove tray from oven and allow the cookies to cool down. Then, enjoy! Leftovers can be stored in a sealed cookie jar for up to 1 week. These would be perfect with my afternoon tea! I will be shipping up a batch this evening!